If Shadow Complex 2 ever comes to be, it'll be way sweeter than the first game. 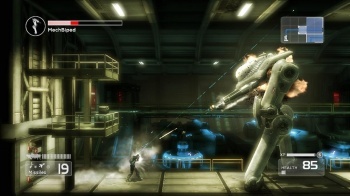 Chair Entertainment and Epic Games' Shadow Complex, released on Xbox Live Arcade in August 2009, was a modern marvel in the Metroidvania mold. It broke the XBLA sales record at launch, but a sequel hasn't been announced. When Chair does come back to it, however, it says that some new ideas are bubbling in the designers' brains. Chair founder Donald Mustard recently spoke to Eurogamer about the upcoming Unreal Engine 3-powered iOS title Infinity Blade, but a few questions were snuck in about Shadow Complex as well. Unfortunately, Mustard was pretty tight-lipped about the future of the Complex franchise. "We love Shadow Complex and we have lots of ideas for the future of Shadow Complex, but that's all we can say right now," Mustard revealed. I loved Shadow Complex so much that I think I'm going to go ahead and say that this statement means Shadow Complex 2 is confirmed, even though it's not. "We'd love to make another one," Mustard continued. "We've got sweet ideas for more stuff but right now everyone is completely focused on getting Infinity Blade out the door." So, once Chair finishes messing around with its iOS project, we'll hopefully see a new Shadow Complex that will be even "sweeter" than the first. Shadow Complex took the ideas forged in games like Super Metroid and Castlevania: Symphony of the Night and brought them into the modern era. As the game's main character explored a massive military complex, he would find equipment that advanced his abilities, which enabled him to reach new areas or find hidden secrets. It was Metroidvania at its core, but dressed up somewhat differently. Another game that takes what Shadow Complex did right and expands on it would be great, because Metroidvania titles are few and far between these days.